As you have seen in this series, for those who have been following along, every facet of the Tabernacle of Moses teaches us wonderful things about Jesus! 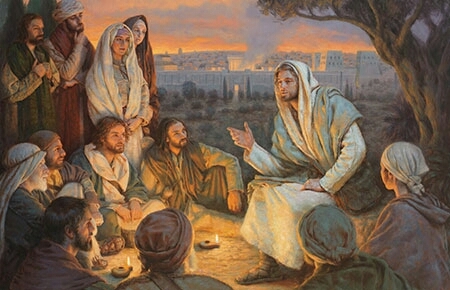 The Holy Spirit is the most wonderful storyteller on the planet. He drew these pictures for us because He knows that, the more we know about Jesus and understand spiritual truths, the more our hearts will be at peace. This is the beauty of the Old Testament. All of the stories, types, and shadows depict different aspects our Lord Jesus, particularly His sacrifice on the cross. I think of it as an expanded view of the New Testament. In this study, we’ll be looking at the construction of the Tabernacle itself, especially the coverings and curtains. This is critical information to understand, particularly in these last days, whether you travel far and wide or stay closer to home. When you go out your door, you need to be assured that you are blessed and protected! One of the best descriptions of how protected we are is found right here, in the coverings and curtains. There were four in all, each made of very different materials, with individual meanings and significance. Even the order in which they are mentioned and put in place are a message. There seems to be a great difference of opinion among Bible scholars about the meaning of this word, “Tachásh.” Even Jewish scholars can’t seem to agree on the correct translation. Martin Luther translated it as “Badger skin,” and many scholars agree with him. There are others, however, who have quite a different take. Some believe the word means, “Porpoise.” Now, obviously, a porpoise is not at all the same kind of animal as a badger. Not even close! Why did scholars think these skins could be creatures that live in the sea? After all, the Israelites constructed the Tabernacle while in the middle of the desert. Where in the world would they get porpoise or dugong? One theory is that, when they passed through the Red Sea, there could have been many such creatures flopping around on the dry ground. They possibly could have just picked them up and brought them along. Other scholars argue that the word means, “Dugong.” That’s a type of manatee! Still other translate it as “Antelope!” What gives? Why the great disparity? It doesn’t appear that there’s any real consensus as to the actual meaning. Is there a reason for this? Yes! Whenever the language of the Bible is unclear, there is something wonderful to unveil about Jesus for our benefit that will bless and encourage. As usual, the Holy Spirit is at it again! He is painting pictures of Jesus in His purposeful ambiguity. New Testament To The Rescue! So, we have four possible things this skin could be: Badger, porpoise, dugong and antelope. Is there anything, anywhere else in scripture that can shed some light here? YES! Remember, the New Testament is all hidden somewhere in the Old. Turn with me now to Matthew 16 where Jesus asked His disciples the question below. He said to them, “But who do you say that I am? Most people in Jesus’ day didn’t quite know what to make of Him. Even today, people outside of Christ some are just as confused. Some said He was John the Baptist (Badger? ); some thought He might be Elijah (porpoise? ); others, Jeremiah (dugong? ); and still others, one of the prophets (antelope?). None of them saw Him as God, but simply a extraordinary man. The confusion in translation is pointing to the difference in opinions as to who Jesus really was! Only God the Father could have revealed this truth to Peter. It did not spring from natural or human reasoning. He drew back the “Curtain,” if you will, and allowed Peter to peer into the “Holy of Holies.” He saw the pure gold of Jesus’ Divine nature and glimpsed, for a moment, who He really was. Unfortunately, that picture didn’t stick with him very long. He later betrayed Him 3 times. Aw, but don’t be too hard on poor Peter. What he did is so completely human, isn’t it? Let’s face it: We all need to be constantly reminded of Who Jesus is. He wasn’t the only one who saw behind the Veil. There were others. Remember the Roman Centurion whose servant was paralyzed? He came to Jesus and begged for him to be healed. Let’s follow the story. We see the same thing in the case of the woman who’s daughter was severely demon-possessed. She, too, pierced the veil of His flesh and saw Who Jesus really was. That’s why she came begging for healing for her daughter and, though she was only a Gentile, she got it. Amazing that these two Gentiles saw through the veil of His flesh and knew Who He was! It amazed Jesus too because most of His own people didn’t know. Man’s View vs. God View. This outer covering is what the eye of man saw; that is, the guise of a rugged, ruddy man, son of an obscure carpenter from the seedy little backwater town of Nazareth. In their eyes, a “Nobody from nowhere.” None of them knew what to make of Him, including His own disciples most of the time, even though His coming was prophesied, longed for, and expected for centuries. People today who are outside of Christ are no less perplexed. Some call Him a great teacher, some a great philosopher, a great prophet, and others, simply a good man. They don’t see what you and I see, Church: The Son of the Living God Who redeemed us from our sins! Flesh and blood has not revealed this to us but the Holy Spirit Himself. 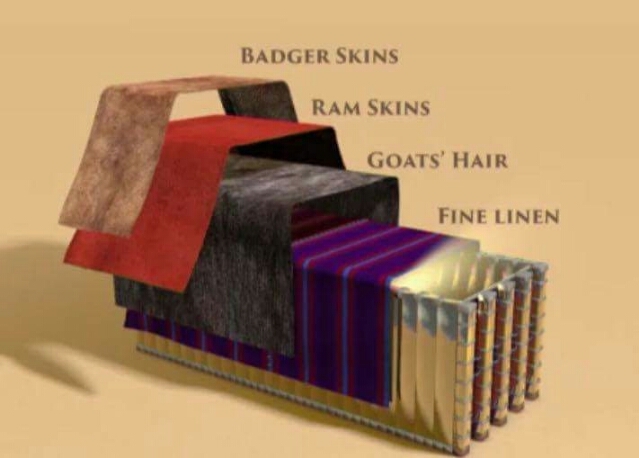 The next covering under the “Badger skin,” was “Ram’s skin dyed red.” A ram is a male Lamb which depicts Jesus’ sacrifice. Red speaks of His work on the cross. He was literally covered in blood in the process of redeeming all of us. What a picture! The ram also depicts Jesus in His determination to save all of us. You’ve heard of a battering ram? That term was coined because rams are very determined. A ram’s strength is in its horns. They are a depiction of strength and authority. They use their horns to obtain their objective, and they are quite persistent. They don’t give up until they have what they want. In the garden of Gethsemane, Jesus, KNOWING ALL THINGS, stepped forward with heavenly dignity, strength and authority when the soldiers came to arrest Him. He didn’t shrink from His task but was DETERMINED to go to the cross, being FULLY AWARE of what was to come. Full of heavenly grace and the dignity of the King of Kings, as Jesus stepped forward and said, “I Am,” all 1,000 big, armed, strong, burly temple soldiers fell to the ground! Here’s another famous ram incident. Remember when Abraham was about to kill his son and the Angel stopped him? He turned around and saw an incredible sight: A RAM CAUGHT BY ITS HORNS IN A THICKET. Abraham must have thought this was a very strange sight. Remember, he was a shepherd by trade and would have known that rams are not only unlikely to be caught by their horns in a thicket: It’s practically impossible. Yet here he was, “conveniently” caught by its horns, not his wool, as one would expect. Why? Because that would have made it unfit as an offering. Had he been caught by his wool, the more he struggled, the more lacerated his skin would have become from the thorns, bleeding everywhere. The ram brings to remembrance the “Ram of consecration,” in Exodus 29. The priests placed their hands on its head, killed it, and put some of the blood on the right ear lobe, the right thumb, and right toe. As I said before, the outer covering is what the eye of man sees. It is what all the people could see. Only the high priest could view the innermost covering of fine linen in the Holy of Holies, and that once a year. All of these things are typologies of Jesus, as Great High Priest, and all of us as priests under Him. We are just like Him: Priests forever after the order of Melchizedek! We see the fine linen, our exalted Great High Prest in heaven. This layer of ram’s skin dyed red could only be seen God. You see, the full measure, appreciation, and estimation of what Jesus did at Calvary is only known fully known the Father and the Son. Remember that very first Passover when the children of Israel put the blood ON THE OUTSIDE of the door? It was OUTSIDE for God to see, not inside for them to see. When the Angel of death passed by, He would see the blood and “Pass over” them. You see, even in eternity Church, you and I will never fully know, understand, or esteem the price Jesus paid for us that day. It is the same with you. There is your outer covering that everyone sees. But there are things that are known only to you and God, things you never share with anyone, both good and bad. Though we haven’t yet covered the fine linen curtains of the innermost layer, it is very similar in construction to the goat’s hair layer except that there are 10 linen curtains. In this layer, however, there were 11, each measuring 4×30 cubits. Why? As you know, nothing in scripture is arbitrary. The Holy Sprit specifically mentions numbers to give depth, richness, and meaning to any passage. Jewish rabbis refer to this as, “Gematria: The meaning of numbers,” which is not numerology that is based on superstition, mind you. “Gematria” is the Hebrew word for “The meaning of numbers,” in the Bible. It may interest you to know that ALL the measurements of the entire Tabernacle are in multiples of 5. 5 is the number of grace! That’s because everything about the Tabernacle, Jesus, is about Jesus Who is full of grace! 4 is the number of creation; 6 is the number of man. One of the reasons for this is there are four Hebrew words for man In the Bible and two Greek words. That’s a total of 6. 5 x 6 = 30. Jesus became a man full of grace to bring grace to us. Amazing Properties Of Goat’s Hair. Many Bedouins in the Middle East today use goat’s hair to weave cloth for their tents. Why goat’s hair? This material, in particular, has amazing abilities. It contracts when rain hits it to keep out the weather. It can protect from the wind. It even expands when it’s hot to let air flow in to keep it cool on the inside the tent. That’s the wisdom of our God! He knows what animal to put where! The curtains made of “Goat hair” also depict Jesus as our “Sin offering.” From the time of His birth, He grew in grace and in knowledge. For 30 years…..6×5=30…..He was being prepared to be offered up as a sacrifice for us all. This time period of His life, other than the incident at the temple when He was 12, is not recorded for us. It is hidden. You’ll notice in the picture above that these curtains of goat’s hair cover the top part of the golden pillars. There was a 6th curtain, that was folded over, covering part of the golden boards as well as the entire Tabernacle. Here’s why. The 6th curtain was folded over to hide the top third of the golden pillars in front, depicting that 30-year hidden life. 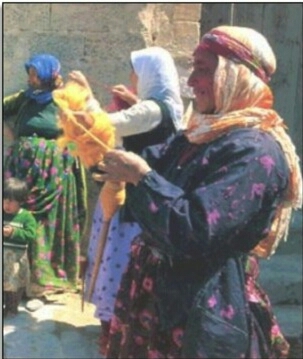 According to Exodus 35, verses 25 & 26, skilled women artisans wove the goat’s hair and the fine linen curtains. Notice the order in which they are mentioned. The linen curtains are mentioned first, then the goat’s hair, in that order. But look what is also recorded. Most of the time, it is only men who are mentioned in scripture. But here, in Exodus 35, the Holy Spirit points out, in particuar, that WOMEN wove these curtains. The reason why will soon become clear. Construction of the entire Tabernacle, from the golden boards, the implements, menorah, table of shewbread, altar of incense, Ark of the Covenant, to the curtains and coverings took nine months to complete. What does that sound like? Human gestation! Mary was pregnant with Jesus for nine months. THAT’S WHY WOMEN SPUN THE YARN. The Entrance Of The Tabernacle. Before we get to the linen curtains, let’s look at the Tabernacle itself. There are some very revealing details. As you approach the outer court, there are FOUR GOLDEN PILLARS with curtains of fine linen hanging from them. But at the entrance to the Tabernacle itself, there are FIVE GOLDEN PILLARS. Bet you’d like to know why. Think for a minute: Where do you find all the stories and accounts of Jesus’ life on earth? YES! THE FOUR GOSPELS. We are first introduced to our Lord Jesus through the Gospels so that we can become “Born again” when we accept Him as our Savior. This then gains us admittance into the outer court where the Bronze Altar is located. Bronze in the Bible is a picture of judgment. The altar is in the shape of a cross. That’s because your sins were “Judged at the cross!” But God wants you and I to go deeper, into the Holy Of Holies. That is the best place to be. Peter, James, John, Jude and Paul. Five is the number of grace! Under our dispensation, the Covenant of GRACE, Jesus has shed His blood. Now that He has died, there is no more Holy Place and Holy of Holies because the Father ripped the veil in two! There is only the Holy of Holies, surrounded by 48 golden boards, routed in silver sockets, all facing the Mercy Seat. That’s a picture of us, Church! We are wooden boards: Wood is a picture of humanity, covered by gold: Gold is a picture of divinity, and rooted in silver, a picture of redemption. That’s right, we’re golden pillars in the house of the Lord! Those who are most intimate with Jesus have passed through “Grace: The five pillars,” into the Holy Of Holies. They are secure in their “Redemption: The silver sockets,” (silver depicts redemption) and continually behold the face of Jesus. They are the ones who remain seated, resting in His presence. It’s the place of greatest protection and peace. Finally, we come to the curtains of fine linen. You already know that they were woven by the women and why. Look at the picture below. If you were able to enter the Holy of Holies, you would see the curtains above your head. You would see the colors of blue, purple, scarlet, and fine linen. They are woven with artistic designs of Cherubim with wings unfurled. The badger skin is what the eye of man sees. The ram’s skin dyed red is what only the eye of God sees. The fine linen represents what Jesus is in heaven. He is the finest linen: Heavenly, regal, royalty, beloved of the Father, and seated at His right hand. In the opening scripture, you are reading the only time “Fine linen” is mentioned first, then “Blue, purple, scarlet. Everywhere else, it is recorded as “Blue, purpe, scarlet are first, “Fine linen” last. Why is the order reversed? Once again, The Holy Spirit, our Master Storyteller, is drawing picture for us! The reason the order is reversed is this: In the Gospels, you see Jesus called or referred to as “Jesus Christ.” Jesus is first, Christ, His title, is second. But in the epistles, you often see it reversed. You and I are sanctified “in Christ Jesus.” Why? The entire structure is a beautiful picture of the Person of our Lord Jesus. So remember: As He is, so are we in this world. He is our true identity. Church, that means you and I are just as covered and just as protected: Four-times covered! We don’t walk around in this dangerous world, vulnerable like unbelievers. We are safe and secure under His wings. Our Father wants us to walk through life and KNOW that we are not uncovered. We are loved, warmed, protected, provided for, and secure. We are under His wings and Four Times Covered. Hope you are well. What a superb website you have with such helpful visual material on the tabernacle. I disciple a group of 5 lads in Scotland each week and am working through the bible. We are soon coming to the tabernacle and I am looking for great visual resources to use as part of a presentation with them. I was wondering if I might be able to purchase some HD Photos of the tabernacle furniture that you have? The model you have produced is fantastic, I have to say. I can pay you directly by paypal to make life easier for you. Many thanks David and keep up the good work. Wow! So glad you are helped and blessed! Not sure how to go about doing what you ask. I can email you whatever you like and you can make your own PowerPoint. One of the pastor’s groups I teach in the Philippines has a tech savvy son who does that very thing. I just email to him whatever he needs. My whole reason to write the things I do that amaze and bless me is to bless and amaze others with the beauty of our awesome Jesus and to bless the Church with grace. You may take and use whatever you like at no charge. If it blesses and teaches those young people, then I have reached my goal!